I came across a recipe a while ago for Cashew-Banana Bread but didn’t have the proper ingredients to hand when I was about to make it. I altered the ingredients drastically so renamed it Banana and Pecan Muffins. Instead of whole wheat flour, I used gluten-free plain white; I used three bananas instead of two; coconut milk instead of cashew milk and pecans instead of toasted and chopped cashews. I also used maple syrup instead of honey. 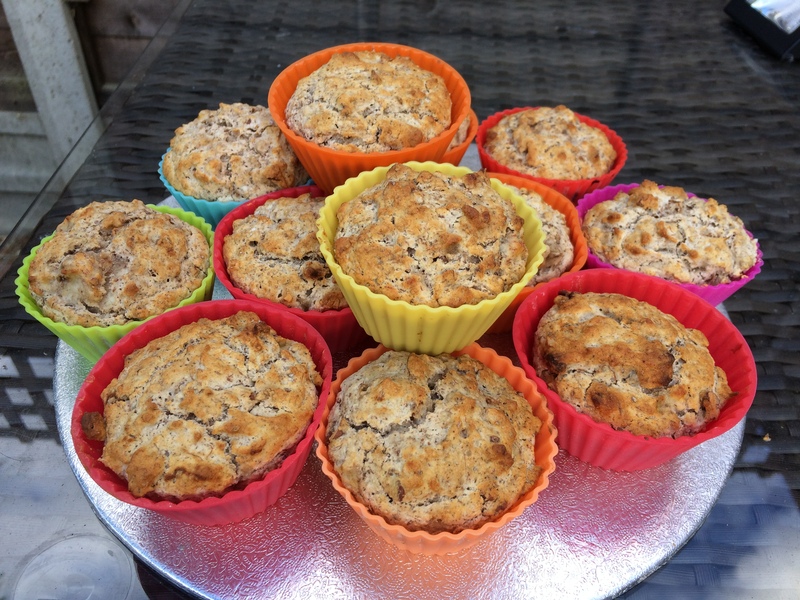 The end result was lovely tasty, fluffy muffins which my grandchildren (and husband) loved. The ginger gave the muffins just a tiny bit of ‘warmth’. This recipe made 12 muffins and six slightly smaller ones (cake cases). I did find that the muffins stuck to the paper cake cases but just fell out of the silicon ones perfectly. The bananas and apple sauce ensured these muffins were lovely and moist. Mix together the flour, flaxseed, baking powder, baking soda and spices. Place the bananas in a large bowl and mash until smooth. Stir in the apple sauce, coconut milk, maple syrup and vanilla extract. Add to the flour mixture and stir until just mixed. Fold in the chopped nuts. Fill muffin cases ¾ full with the mixture and bake for approximately 25 minutes at 350°F. This entry was posted in Sweets and Treats and tagged apple sauce, Banana, Cooking, Ginger, Gluten Free, Healthy Eating, Muffins, Pecans, Wheat-Free. Bookmark the permalink.